Terrie is a creative person who loves DIY on a budget and updating her farm house. She enjoys sharing creative tips, tricks, and knowledge. Acrylic paintings can be done, in a few different ways. I am starting with the picture in pink and purple. Then an art piece with a variety of colors using the style of Jerry Yarnell, painted by following his steps on TV. The third painting was done, by following one of Jerrys painting books that come with easy to follow directions. The fourth painting was started in a ladies paint night and isn't quite finished, yet. The class was watching a Video on the Bob Ross technique, but we painted with acrylics, not oil paints. Don't be too serious, have fun and enjoy. Let your creative juices flow. Start with a blank canvas and your primary paint colors and a cup of water and a paint pallet for mixing your paints. Have a roll of paper towel close by, for cleaning brushes and drying your brushes. I also like to use an Acrylic paint medium, and it makes blending colors easier. (medium keeps acrylic paint from drying too fast. )For beginners, a five pack of brushes is the best way to go. As you progress or paint more, then purchase a larger amount or more, expensive brushes. If the brush package doesn't have a fan brush, I recommend getting one. Pine, fir and spruce trees are easier to paint with this brush. The acrylic medium should be kept in a separate container and added to the pallet as you need it for blending with the paints. Take your paint pallet or paper plate, if you don't have one and apply a small amount of each color you will be using for your painting. Make sure to leave room for mixing colors. Now let's begin by using your largest brush, or gesso brush to combined your base color with the acrylic paint medium. It provides a base that makes blending colors easier. Load your brush with the color choice for your background along with the paint medium. Take a break or allow to dry just a little and pencil in the screen or object you want in your painting. I call it a basic outline or roughing in your picture. Most paintings you will divide into thirds. That is background, middle ground, and foreground. Paint each area as you move from top to bottom of the canvas. The top will become the background. Middle of the canvas is the middle ground and foreground is the bottom area of your painting when it's complete. Add your shadows or dark areas first at the outside edges, blending and adding lighter color towards the middle. Blending will add dimension and interest to your painting. Remember to soften as you go leaving color space of dark and light. As you complete each of the three sections of your painting, you will see it take shape. Once, the base colors are finished then move on to the details. Use dark colors in detail first, and then you use light colors to show the dark. Adding light is called highlighting. As you paint, take a step back and look at your painting. Don't get too far ahead before doing this. Standing close to the picture always gives a different perspective, back up just a little and look at your painting. Decide where you want the sunlight in the painting. Now you have completed your painting with the amount of detail you want. The fun part of painting with acrylic paint is you can paint over it when it dries or set it aside and go back to add paint details later.These are the basic steps for painting with acrylics. I'll be getting into more detail of each painting further into this article. 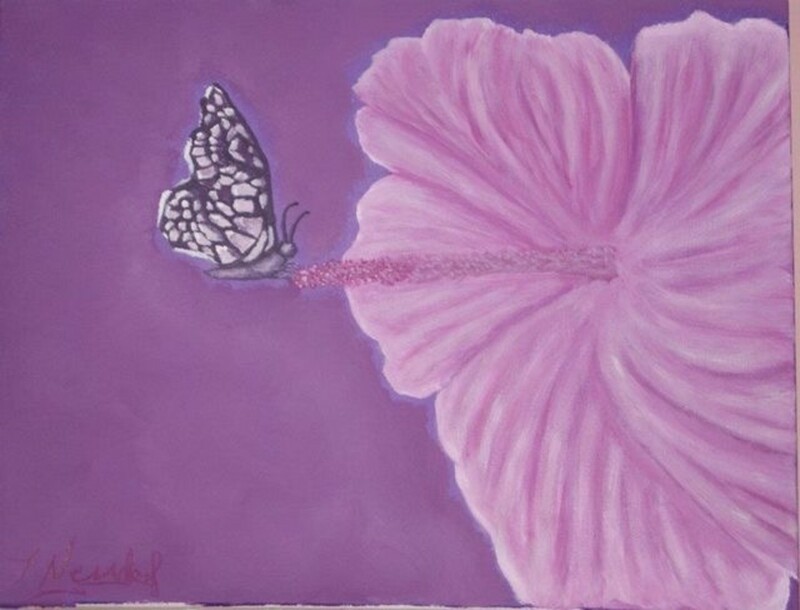 The guidelines for this painting in purple and pink, came from my granddaughter wanting a picture for her bedroom and it had to include a butterfly. The flower was the first painting I did without the use of an Acrylic blending medium. I must confess the use of blending mediums makes the painting with acrylic a whole lot easier. She was happy with the finished painting. 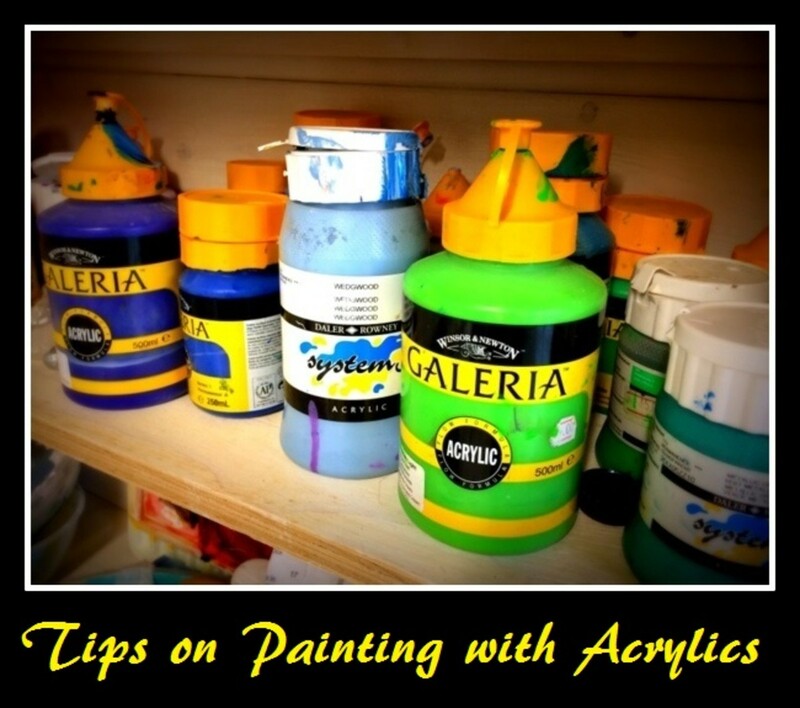 Start by gathering your paints and tray, along with a cup of water and paper towel. The colors I used were, pink, purple, white, yellow, dark blue, brown and a small amount of black. Start by loading your broad brush with purple and white. Keep the darker shade of your purple towards the outside edge of the painting. Then add purple to white and load your brush with the lighter paint mix. Then tap your brush on the paper towel and then gently blend back and forth towards the middle of your canvas. The color blending gives focus to the middle of your painting. For the picture, you can draw freehand onto the canvas or use a stencil. You can also use a photo of your choice and make it what you want. This one was drawn, on free hand. I used a picture of a flower and one of a butterfly, then changed it to make the complete picture. Keeping your painting in only a few shades of color makes it a lot easier to paint. Use dark of your color to show shadows and use light to highlight the light. You can make it abstract or more real. 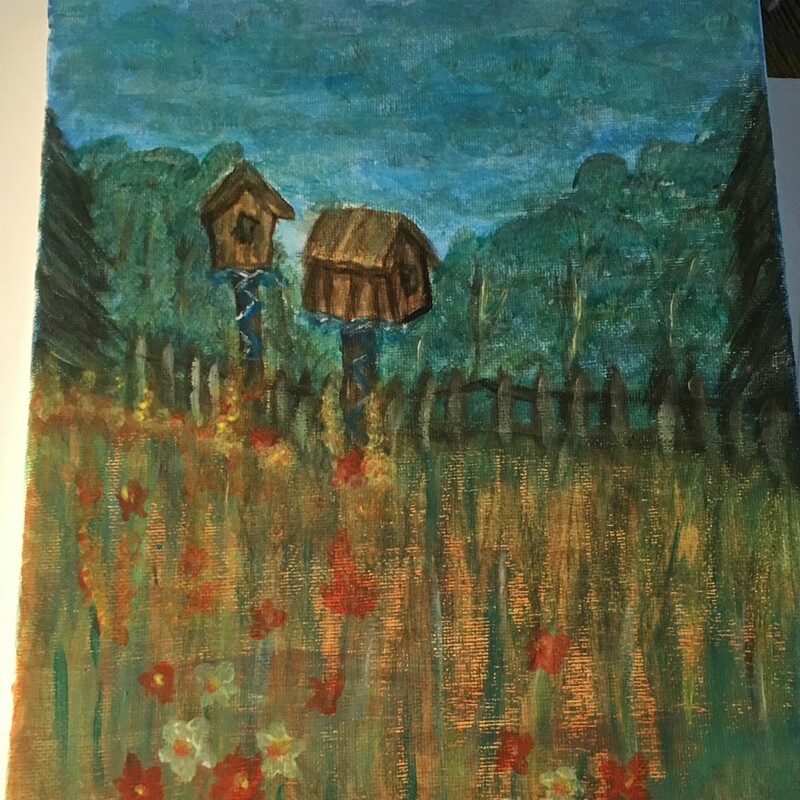 I kept it simple to show my granddaughter how to paint. Reload your brush with paint as you go and change to a smaller brush when you get to the more detailed parts. Remember to step back and have a look. The perspective is different from further away. To add flower stamen detail, I used the sharp end of a paint brush and dipped it in the paint and made dots on the center. For painting the butterfly, use the paint colors you chose and load your flat brush and form the shape of the wings. Then use a smaller tip brush and draw in your pattern details. You decide how little or how much detail you want. For beginners, the simpler you make the painting, the better. Practice not only changes how you paint, but it also helps you relieve stress and express your creative side. Now the canvas and brush are in your hand, what you do with it is up to you. The best thing about Acrylic paint is it dries fast! The worst thing about Acrylic paint is it dries fast! 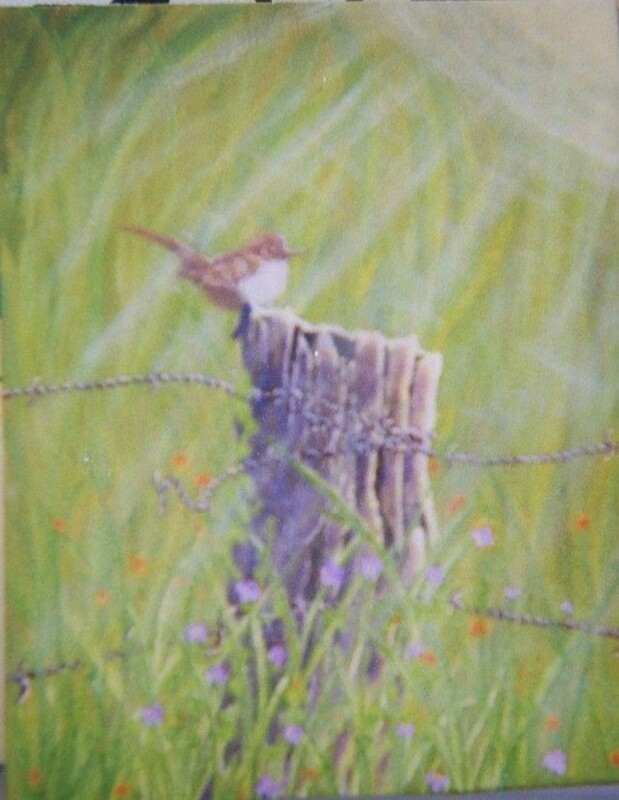 Wren on an old fence post. Acrylics and dry brushing paint. While learning to paint green grass and old wooden fences, I found this scene in a Jerry Yarnell painting book. I chose to add the Wren to make it mine. This same picture showed me how to paint barbed wire. Then when the painting, was finished I dry brushed the sunshine coming from the upper corner of the canvas. The Post and fence were the first painting I did with these elements in it. I love how the fence post turned out. One thing I would change is the dry brushing of the sunlight. It would be lighter if I painted it now. If you are just starting to paint, you could break up these elements and paint them on their own first. The basic beginning steps are the same as the other paintings using a paint medium and breaking your canvas up into thirds. For the background then moving to the middle ground and forward to the bottom of the picture. Keep it light and use rounded brushes for the grass. It takes three shades of green and a green, yellow to make all the blades of grass. Then plan your stump or fence post with any bird you choose. Remember the rule of dark and light to texture and build your fence post to look like a stump. You can make it as smooth or as rough as you want. When the fence post, is done. Add your barbed wire. Use a light color to make it look twisted then paint in the barbs. Use a fine tip brush and work on an angle to make the twist in short strokes, gently bring it from the top of the wire around to the bottom. Allowing space in between each twist.it will look almost like a rounded L turned upside down. Finish up your painting by picking the wildflower colors and randomly dabbing them where you want them. Them using a fine brush bring a stem up from the ground to meet them. Paint Tip: Grass is fun to paint. Don't take it too seriously. Roll your round brush in the paint and make long strokes for tall grass and short quick strokes for short grass. Then add highlights to give it some dimension. To dry brush in the sunlight, you load your brush with paint them dab most of it off on the paper towel. So you have a relatively dry brush. Then gently swipe your brush across the painting to make the sunlight. Have you painted with Acrylic paints? 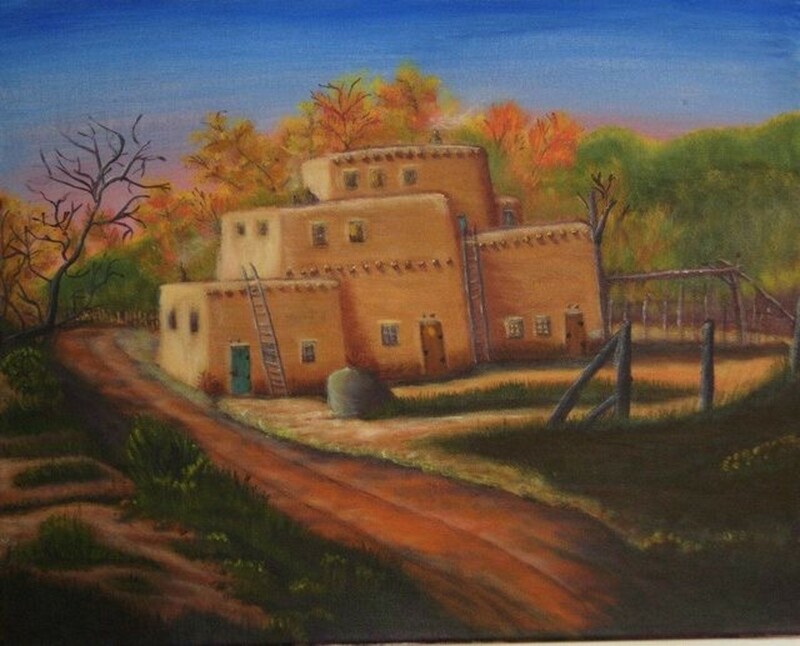 Jerry Yarnell style of painting and adobe home. With Acrylic medium. Ladies paint night. No Acrylic medium used. Creating this painting was the most fun of all. Four hours later it was still unfinished, it still is. Getting together with a group of creative ladies was an amazing way to spend an afternoon. This painting made me realize how hard it is to blend acrylics without using a paint medium, ( Gesso). The great time we had made it so that it didn't matter. Painting with acrylics is a lot of fun. The steps to complete this painting uses the same basics as the others. This painting is done, with only the five paint colors that come in a kit for Beginners. 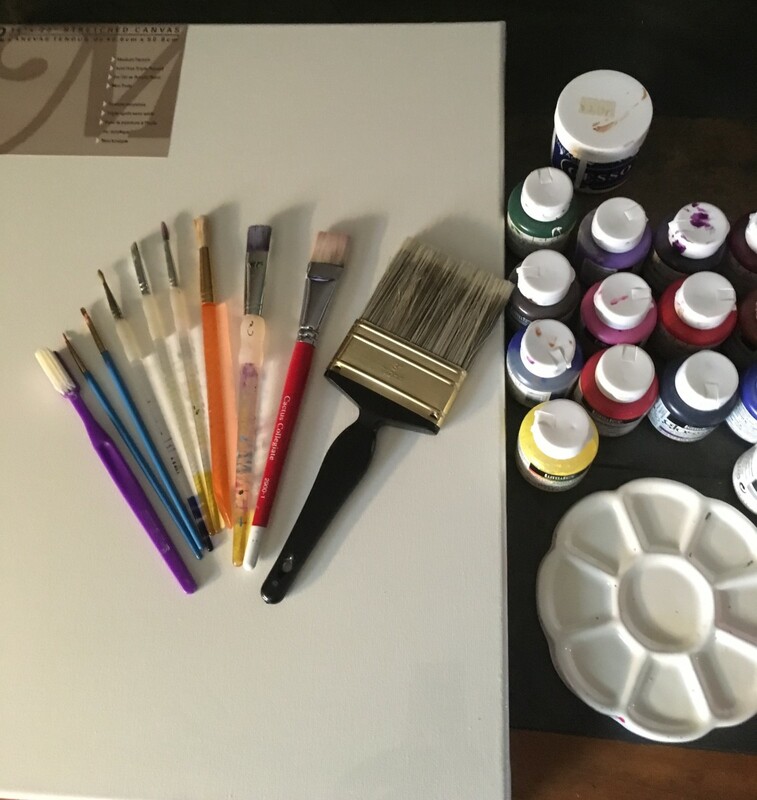 Start with all the supplies you would use for painting on canvas. Paint the background with your paint Colours. I divided this canvas in half, and the top was, covered in blue and white. Blending them together, keeping the paint wet while you blend. These colors are the base area of your sky and behind the trees. Then paint the bottom area or half with your ground colors. My primary colors for the ground area started with brown, white, yellow and green. Do not over mix or make muddy, you want a variety of ground color to build your foreground. When you paint without a medium, you will need to wet your brush and tap it on a paper towel once in awhile to help keep it wet for blending. Now you can rough draw in your picture or landscape. This one was a drawing used for crafts. My items or ideas were added to make it different. Both of the last two paintings were, done on the basis, of dividing the canvas into thirds. Like I mentioned at the beginning, breaking it up into background, midground, and foreground. The main difference is the first one uses the acrylic medium (gesso) for blending and the second one only uses water and paints for blending. For the detail work and painting in trees and shrubs, use a flat brush, stipple brush and then a small thin brush for the highlights and small details. Always start items with the darker color then use the lighter one to add highlights. The more light color you add, the more detail and appearance of sunlight your painting will have. Remember again to step back and view your picture before you add too much. A hint or suggestion of something looks better than overdoing it. Thank you Brittany. I love to paint and draw. I am now working on a large piece for my kitchen cupboard doors instead of using glass. Have a great day. I am glad you like it. My man is a great artist. I like this article a lot. Good work!